What is coriander? What is it used for? Coriander is an annual herb indigenous to southern Europe, but now produced throughout Asia and parts of North America as well. It consists of a slender, branched body that can reach a height of three feet, with leaves similar to those of parsley, and flowers that range in color from white to mauve. The plant itself is strikingly green, but has a rather distinct odor; its name is derived from the Greek "koros," meaning bug, in reference to the smell of its leaves. The plant is usually harvested in August, then dried and cut into pieces. Coriander is widely used throughout the world as a condiment, and forms an ingredient in many curry powders. It also has a long history of medicinal use; Hippocrates and other Greek physicians used it in their healing efforts, and often employed it as an aphrodisiac. In traditional Chinese medicine, coriander is considered pungent and warm, and is associated with the Lung and Stomach meridians. 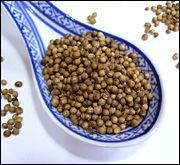 Coriander seeds are used to treat conditions such as stomachaches, measles, nausea and hernias, and also have tonic properties. Some practitioners also use coriander seeds as flavorings to improve the taste of other herbal remedies. How much coriander should I take? The typical dose of coriander is dependent on the condition being treated. As a fluid extract, some herbalists may recommend between 5 and 30 drops. As an infusion, the typical dose is two teaspoons of dried seeds mixed with one cup of water. As a powder, the usual dose is one-quarter teaspoon to one-half teaspoon. Orange peel, peppermint oil and dates may also be added. What forms of coriander are available? Coriander is available in several forms (dried, powder, extract, infusion), all of which can be found at herbal stores and Asian markets. What can happen if I take too much coriander? Are there any interactions I should be aware of? What precautions should I take? One of the chemical constituents of coriander, linalool, has been shown to cause contact dermatitis in some sensitive individuals; as a result, it should not be taken by people who are allergic to linalool. When treating measles, it should not be used in cases in which there is no skin rash. As always, make sure to consult with a licensed health care provider before taking coriander or any other herbal remedy or dietary supplement. Al-Bataina BA, Maslat AO, Al-Kofahil MM. Element analysis and biological studies on ten Oriental spices using XRF and Ames test. J Trace Elem Med Biol 2003;17(2):85-90. Eriksson NE, Moller C, Werner S, et al. Self-reported food hypersensitivity in Sweden, Denmark, Estonia, Lithuania, and Russia. J Investig Allergol Clin Immunol 2004;14(1):70-9. Esiyok D, Otles S, Akcicek E. Herbs as a food source in Turkey. Asian Pac J Cancer Prev July-September 2004;5(3):334-9. Kubo I, Fujita K, Kubo A, et al. Antibacterial activity of coriander volatile compounds against salmonella choleraesuis. J Agric Food Chem June 2, 2004;52(11):3329-32.